The Department of Family Medicine (DFM) welcomed Tillman Farley, MD, the son of Gene and Linda Farley, as its 2014 Eugene Farley Visiting Professor. He spoke to the DFM at its annual Farley/Frey reception and during Statewide Grand Rounds on September 3 and 4, 2014. In his presentation at the Farley/Frey reception, “Expanding the Primary Care Team to Address the Social Determinants of Health,” Dr. Farley talked about the work of Salud Family Health Centers, the community health center he leads in Colorado. He explained how factors such as income, education, housing, race and ethnicity, and food security impact the health of people and communities, and how primary care providers can look beyond clinic walls to address those factors and improve population health. In his Statewide Grand Rounds presentation, “The Role of Race and Racism in Health Disparities,”, he spoke about how biases can lead to health disparities in ethnic, racial, and other minority groups. He then shared strategies for improvement, such as collecting and analyzing data, improving cultural sensitivity, increasing workforce diversity and better understanding community culture and values. Dr. Farley is the executive vice president for medical services of Salud Family Health Centers, a migrant/community health center with clinics across north and northeast Colorado, and an associate professor in the Department of Family Medicine in the University of Colorado School of Medicine. Dr. Farley graduated from the University of Colorado School of Medicine, and completed his residency in Family Medicine at the University of Rochester. He spent three years in private practice in upstate New York, and three years in practice in far west Texas directing two federally qualified rural health centers prior to moving to Colorado. Dr. Farley has implemented a variety of successful integrated care models in practices in New York, Texas and Colorado. He lectures widely on integrated primary care, community health, health disparities, racism in healthcare, and immigrant health. All of this year’s submissions can be viewed at https://inside.fammed.wisc.edu/announcements/22321. 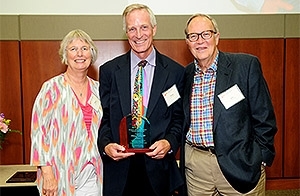 The Frey Writing Awards were established in 2010 to honor John Frey, III, MD, past chair of the DFM, and to recognize and encourage individual creative writing.